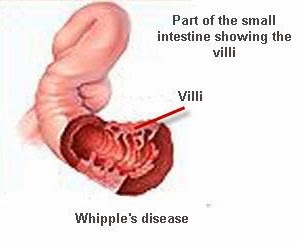 Whipple's disease is a rare bacterial infection that most often affects your gastrointestinal system. Whipple's disease interferes with normal digestion by impairing the breakdown of foods, such as fats and carbohydrates, and hampering your body's ability to absorb nutrients. Whipple's disease also can infect other organs, including your brain, heart, joints and eyes. It is speculated that symptoms occur in people who have a genetic predisposition to developing the illness. White, middle-aged men (between 40 and 60) are more likely to contract the condition than any other group . In places that lack fresh water and proper sanitation, the rate for Whipple’s disease tends to be higher. Without proper treatment, Whipple's disease can be serious or fatal. However, a course of antibiotics can treat Whipple's disease. Bacteria called Tropheryma whipplei (T. whipplei) cause Whipple's disease. T. whipplei infection can cause internal sores, also called lesions, and the thickening of tissues. Villi, which are tiny fingerlike projections that line the small intestine, take on an abnormal, clublike appearance. The damaged intestinal lining fails to properly absorb nutrients, causing diarrhea and malnutrition. Scientists are unsure how T. whipplei infects people. One theory is that some people are more vulnerable to Whipple's disease—probably due to genetic factors that influence the body's immune system. This theory is supported by the existence of a relatively high number of asymptomatic carriers—people who have the bacteria in their bodies but don't get sick. Also, the bacteria are more common in the environment—showing up in soil and sewage wastewater—than would be predicted based on the rareness of the disease. And while multiple cases of Whipple’s disease have occurred within the same family, no documentation exists of a person-to-person transmission. Whipple's disease is extremely uncommon. What are the signs and symptoms of Whipple’s disease? Neurologic symptoms occur in some people diagnosed with Whipple’s disease and can mimic symptoms of almost any other neurologic condition. Symptoms of neurologic, lung, or heart disease occasionally appear without gastrointestinal symptoms. If the disease is not treated, this second stage may last for a number of years. Then more severe symptoms may occur due to the lack of nutrients reaching different parts of the body. Symptoms may occur in any part of the body, but most likely the heart, nervous system, brain, lungs, eyes, or skin. If the disease still is not treated, it usually causes death in this third stage. Whipple's disease is potentially life-threatening, yet usually treatable. Contact your doctor if you experience unusual signs or symptoms, such as unexplained weight loss or joint pain. Your doctor can perform tests to determine the cause of your symptoms. Even after the infection is diagnosed and you're receiving treatment, let your doctor know if your symptoms don't improve. Sometimes antibiotic therapy isn't effective because the bacteria are resistant to the particular drug you're taking. The disease can recur, so it's important to watch for the re-emergence of symptoms. Treatment of Whipple's disease is with antibiotics, either alone or in combination, which can destroy the bacteria causing the infection. Treatment is long term, generally lasting a year or two, in an effort to destroy the bacteria. But relief from symptoms typically comes much quicker, often within the first week or two. Most people with no brain or nervous system complications recover completely after a full course of antibiotics. When choosing antibiotics, doctors often select those that not only wipe out infections of the intestinal tract but also cross the blood-brain barrier — a layer of tissue around your brain — in order to eliminate bacteria that may have entered your brain and central nervous system. Because of the lengthy use of antibiotics, your doctor will need to monitor your condition for development of resistance to the drugs. If you relapse during treatment, your doctor may change your antibiotics. In most cases, Whipple's disease therapy begins with 14 days of intravenous (IV) ceftriaxone (Rocephin). Following that initial therapy, you'll likely take an oral course of sulfamethoxazole-trimethoprim, or SMX- TMP, (Bactrim, Septra), for one to two years. A shorter duration of antibiotic treatment may lead to a relapse. Possible side effects of ceftriaxone and SMX- TMP include mild diarrhea, nausea and vomiting. If you have neurologic symptoms, you may be started immediately on a 12- to 18-month course of oral doxycycline (Vibramycin) combined with the antimalarial drug hydroxychloroquine (Plaquenil). You'll also be given long-term antibiotics that can enter the cerebrospinal fluid and brain, such as TMP-SMX. Possible side effects of doxycycline include loss of appetite, nausea, vomiting and sensitivity to sunlight. Hydroxychloroquine may cause loss of appetite, diarrhea, headache, stomach cramps and dizziness. Your symptoms should improve within one to two weeks of starting antibiotic treatment and go away entirely within about one month. But even though symptoms improve quickly, further laboratory tests may reveal presence of the bacteria for two or more years after you begin taking antibiotics. Follow-up testing will help your doctor determine when you can stop taking antibiotics. Regular monitoring can also indicate development of resistance to a particular drug, often reflected in a lack of improvement of your symptoms. Even after successful treatment, Whipple's disease can recur. Doctors usually advise regular checkups. If you've experienced a recurrence, you'll need to repeat antibiotic therapy. Because of the nutrient-absorption difficulties associated with Whipple's disease, your doctor may recommend taking vitamin and mineral supplements to ensure adequate nutrition. Your body may require additional vitamin D, folic acid, calcium, iron and magnesium. Currently, there is no known way to prevent Whipple's disease. What is the likely outcome for people with Whipple's disease? After treatment, the likely outcome for most people with Whipple's disease is good. Most symptoms disappear in about 1 month. Relapse is common, however, highlighting the need to closely watch for a return of symptoms. Endoscopy with small intestinal biopsy followed by PAS staining and electron microscopy or PCR testing should be repeated 1 year after the start of treatment. People with neurologic Whipple's disease who relapse tend to have much poorer health outcomes, including serious neurologic symptoms and even death; therefore, some scientists argue that all cases of Whipple's disease should be considered neurologic. Relapsing neurologic Whipple’s disease is sometimes treated with a combination of antibiotics and weekly injections of interferon gamma (IFNγ)—a substance made by the body that activates the immune system. After treatment begins, many of the symptoms will go away within a month. The best thing you can do is to faithfully take your antibiotics. Relapses are common, and when they occur, additional symptoms, such as neurological problems, can show up as well.